Blackburnian Warbler: Breeds from Saskatchewan east to Nova Scotia, south to the Great Lakes, southern New England, and in mountains to northern Georgia. Spends winters in the tropics. 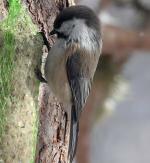 Preferred habitats include mixed forests of hemlock, spruce, and various hardwoods. 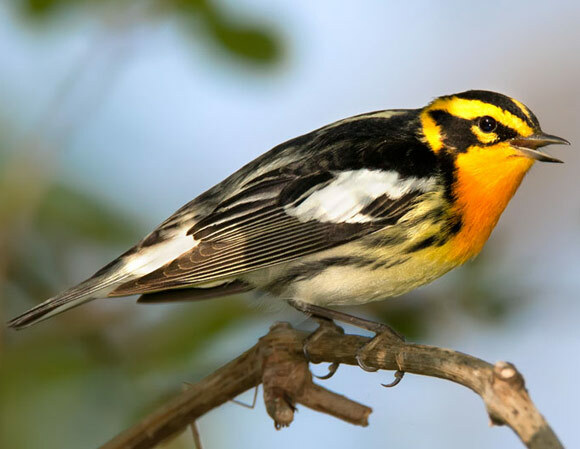 The Blackburnian Warbler is a small songbird which is widely distributed in North America, including southern Canada, the Great Lakes and South Carolina. In winter months, they migrate to Central and South America. 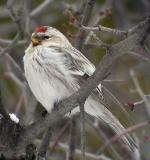 They are characterized by a distinct yellow and black head pattern with an orange throat. Breeding grounds for the Blackburnian Warbler include coniferous and mixed woods, and they prefer spruce and hemlock trees. Their diet consists mostly of insects, but they will occasionally eat berries as well. Due to their wide distribution and evidence of stable or growing populations, the Blackburnian Warbler is classified as Least Concern.